January's gone quickly hasn't it? Are you all getting ready to start drinking and giving up on the gym on the 1st February? I thought it was the wrong month to try such tactics as I was in Barcelona last week and will be in Brussels for a few days next week. I will be back for Bad Language at the Castle on Wednesday, where I'm reading in the open mic spot. Nice to have something doing; even a small thing; as since Christmas I've hardly had a space to think creatively. Poetry's a strange thing in that when you're not doing it, I don't think I think of myself in any way as a poet. There's something distant from the writing of poetry and its place in the world. The distance is, I think, what makes it good, but it also disconcerts a little bit. There's an anthology coming out shortly where I've a couple of poems; so that's good; and various other poems have been sent off somewhere or other and I've just remembered about the Pighog poetry prize - deadline end of the month. I've been working on two separate "collections" if you like: the first is a series of poems set in Manchester; a project I've been thinking about for a while and are some way along with. I'll possibly read some of these at Bad Language. The second is a more general "follow up" to my Salt Modern Voices collection "Playing Solitaire for Money", though I'm not sure if and when it will come out; my other press Knives Forks and Spoons has stopped publishing, and Salt's had a few changes as well. So, I've two pamphlets that may or may not be doing the rounds; may or may not be published later in the year. The good thing is that some of the individual poems are among my best, I think. Its taken me a while to work up my muse in a particular way since touring "Solitaire" - whereas in my other writing I'm quite project focussed, in poetry I'm much more of an organic writer. 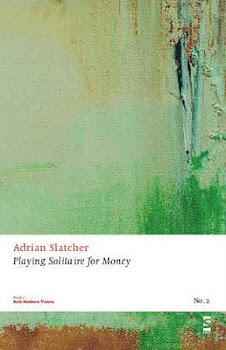 So if anyone out there's looking to publish a nice pamphlet with some of my best work; or in particular is interested in a Manchester sequence - then please get in touch (www.adrianslatcher.com has the details!). The frustration has been not having much time to get on with anything. I even started a prose piece a week or two ago and then abandoned it as last weekend and this have been dominated by travel. I'm still reading the first book I downloaded to my Nook before Christmas as well! The puzzle is what to do next... as busy as the literary scene is in Manchester, I'm not particularly interested in just reading for the sake of it - more in creating finished work, in whatever genre. Anyway, these things have a tendency to ebb and flow - there just always seems a weird disconnect between when you are actually writing something good (which I feel I have this last year or so) and the world in which it needs to appear in to have any presence. The list of writers shortlisted for the international Man Booker was interesting...I'd only heard of three, and I'm reasonably literate...but then again, Tim Parks on the judging panel had only heard of one beforehand. I think if the prize is about bringing forward writers of merit that we might not know about it, rather than a pseudo-Nobel, then it will be a good thing. The literary event season hasn't stopped. A night of poetry, music and performance, Free Frame of Reference on Tuesday just gone at Sand Bar; and then Jenn Ashworth's novel launch (for her 3rd novel, the multi-narrated "The Friday Gospels") at Blackwells on Friday. Poets at the first, fiction writers at the second, it seems - and me at both! This week poets should be directed to the Penning Perfumes launch on Wednesday at Kraak Gallery - "a scented evening of poems inspired by perfumes, and perfumes inspired by poems". Whilst the novelists will no doubt be looking for familiar faces - both on and off the page - at the Anthony Burgess Foundation on Thursday, when Nicholas Royle launches his Didsbury-set (the Didsbury set?) "First Novel" along with Booker shortlisted Alison Moore. Short story writers and readers may give this a miss and head for a Comma Press reading at Madlab on Edge Street - Icelandic short story writer Agust Borgthor Sverrison. I guess you pays your money (or not, both events are free), and takes your choice. Though of course, just because you read one thing, doesn't mean that you can't benefit from seeing another - and increasingly - with performance events especially there's a pluralism. The following week I've got a short open mic spot at Bad Language, first time I've managed to read there, at the Castle on Wednesday 30th, and haven't decided yet whether it will be fiction or poetry; then on the 31st Manchester Art Gallery is open for a zine fair which should appeal to artistic and literary types alike. Not bad for quiet January. Now, to find time to read a book. Yesterday was "Delia Derbyshire Day", a day of screenings, talks and performances at Band on the Wall in Manchester to celebrate the late Delia Derbyshire, who is famed for her work primarily with the BBC Radiophonic Workshop in the 1960s and early 1970s. Derbyshire is an unusual cult figure in that her work was ubiquitous in homes throughout Britain, albeit virtually anonymously. Most famously, her treatment of Ron Grainger's "Dr. Who Theme", for which she was denied a songwriting credit (Grainger wanted her to have one, but it was against BBC policy.) Her name became better known towards the end of her life (she died in 2001), as cult artists like Sonic Boom, Broadcast and Stereolab, took inspiration from her early sonic experiments; yet even now very little of her music - primarily written for commission - is available; yet in the late 1960s she was already recognised as a pioneer of electronic music and her music appeared at "happenings" and art festivals. The day started with Canadian film maker Kara Blake's short documentary, "The Delian Mode." A compact 25 minutes, its more like a film essay or visual tone poem than a traditional film; using Delia's music and words throughout to construct a portrait of her creative process. A deserved award-winner, its pulls up some great footage and audio. This was followed by a Q&A particularly focussing on the Delia Derbyshire archive which is now at the University of Manchester. Those in the packed audience hoping for some announcements about new Delia material were to be disappointed, as the archive process is a slow and painstaking one; as the tapes they had been left in Delia's loft for years, and any "context" for them was missing. There is also a BBC Radiophonic Workshop archive, looked after by Mark Ayres - and the story of the workshop, Delia's role in it, and the interest that remains in the both it and her have grown steadily over the years. It was a shame that Teresa Winter was unable to be on the panel as advertised, as the Q&A did tend to the anecdotal; when, for me at least, it is Derbyshire's role in the musical avant garde of the late 60s that is of interest. Though a woman composer, contemporary music still appears to be far behind visual arts and literature in acknowledging female composition - and even in the Radiophonic workshop, the classically trained Derbyshire was renowned as much for her mathematical background as her musical one. Yet, at the time, through her extra-curricular work in White Noise and Unit Delta Plus, she was part of that late 60s avant garde that could find Yoko One, Paul McCartney, the Pink Floyd, Alan Ginsberg, Soft Machine, Cornelius Cardew and others at the same events, festivals and happenings. There is very little early electronic music available, as the only people who had access to the equipment were institutions, such as conservatoires and the BBC, and rock stars like George Harrison and Pete Townsend who were often "loaned" equipment. What fascinates about Delia's work though is that it pre-dates the synthesizer, and yet the principals that it uses, where the "science of sound" is so critical to the painstakingly constructed sound collages made with magnetic tapes, are what has attracted so much contemporary interest. The history of electronic music has several phases, and each phase has a unique sound and context. Therefore Delia was uninterested in the monolithic synths of the late 60s and early 70s, as falling short of the potential of her own experiments; whilst our contemporary sample-based culture, and cheap phrase-samplers and digital audio workstations approximates her world, but in a virtual space, without something of the serendipity that caused the unique sound of much of her work. For when the question was asked about "why Delia?" its not just about her being one of the few women making experimental music in that era, or because she was one of a small number of electronic pioneers, but because the work she created had such a range (as one might expect for one working to commission) and yet was so clearly informed by a creativity and emotional sensitivity. In many ways, the things that have always plagued acceptance of electronic music: that its just button-pushing, that its repetitive, that its "cold", are all refuted in her work; and are testament to her genius. Following the Q&A a "deep listening" session, with tracks both published and unpublished, gave us an opportunity to hear tracks that had inspired the three female artists who would be playing that evening, and who had put together the day. The freshness of the sound, even today, of music mostly recorded around 40 years ago, came crisply through the Band on the Wall's impressive sound system. Yet there's a real mystery to this music - which is ironic really, given it was written for mass public consumption via TV and radio - in that individual pieces from the archive are sometimes uncredited. Working with early synth, the VCS-3, a brilliant electronic pop track from the early 70s, is ten years too early; yet is it Delia? We don't know. To these ears it has some similarity to the experiments of Tonto's Expanding Head Band, but with a rhythmic presence which is something new. For the many tapes in the archive aren't all Delia, and there is a magpie nature to that early Radiophonic workshop work, as a "sound" used on Dr. Who might be re-used elsewhere, both inside and outside the BBC; yet they also add to our understanding of her process, meticulous, perfectionist, time-consuming. The 2nd half of the day was in its own an equal revelation. Electronic musician Caro C, composer Ailís Ní Ríain and artist Naomi Kashiwagi, along with visuals by Kara Blake, formed the "Delia Darlings" and had used the archive as a jumping off point for three original pieces of work. Ailís Ní Ríain piece for double bass and trumpet took some themes from the remarkable Pot au Feu, and used them as a jumping off point; the sparse but rhythmic arrangements, and the unusual choice of instruments was more of a dialogue between the two women composers, than a conventional "cover". The artist Kashiwagi is renowned for her performances using ancient technology, old wind-up gramophones and 78RPM records. As an artist, rather than composer, her challenge was to create something new - in this case a piece of sound art based on an old jazz standard. Using samplers and software for the first time, although I didn't think the piece quite worked as the finished article, the techniques (with an overhead projection of Kashiwagi's turntablism) were interesting, and of the three peformers, perhaps offered the closest dialogue with Delia's compositional technique. It will be interesting to see how Kashiwagi extends or continues with these experiments. Caro C, finished the evening, with a long multi-modal electronic piece. As the only electronic musician its perhaps not a surprise that her engagement with Derbyshire seemed the deepest, for electronic music remains a genre with its own history, and an approach which is often different than traditional forms. Though her piece was a long, multi-part song-suite, there were clear echoes of Derbyshire's musical achievements, filtered, I think, through that historical view of electronic music of which she is such a part. Echoing Derbyshire's technique, Caro C used different everyday objects to create interesting sounds that were added live to the soundtrack.Finishing off, she thanked the audience, and introduced the DJ, who, fittingly, began with Delia's "Dr. Who Theme." I very much doubt if anywhere else in the country there was such a rapt audience on Saturday evening for three new, experimental music pieces; which in itself was a tribute, not just to Delia's influence, but to those who had been touched by her work. Audience, film maker, panellists and artists came together in what was a perfectly conceived day, and a tribute which, in an ideal world, Delia Derbyshire would have been alive to witness. Anyone in Liverpool, Sheffield or Newcastle this week should go along to one of the film/performance events completing the tour. Post script: just thinking about the day again; and what an interesting audience it was - people I knew from various communities - arts, digital, academic contexts - and how it refutes my post from earlier in the day about our love of "mediocrity" - for here we have the opposite in some ways; a brave, sometimes thankless archeology of a figure that can't realistically be called either "major" or "minor." The audience for her work is always going to be small, so whereas an unreleased Michael Jackson album might sell millions, an unreleased Delia Derbyshire record would be in the 1000s at best. Yet I think its her role in electronic music that is so critical - for electronic music is part of a whole wider dialogue about our information age. There's a point in the film where she talks about being influenced by the sound of the bombs falling in Coventry. Is electronic music the sound of our modernity? It still polarises. There's direct link her to the futurists and surrealists; and personally, what I found interesting was the serendipity in her work - she had to discover new sounds to match the visual briefs she'd been given, and because they weren't there, she invented techniques. That technology has made the job easier doesn't mean that the quest for new sounds has ended. Its certainly been core to my own music over the years, and I think fuelled the artists on the Bedroom Cassette Masters compilation that I was recently asked to contribute to.What's interesting about Delia's work, is that it suggests a different direction for electronic music than the one it eventually took; often emotional, often dark, but always both inventive and empathic. There are two ways in which art affects a culture. One is that the artist, never out of nowhere, but perhaps not widely known, does something that changes perception. It comes at you like a cataclysm, it is a "black swan", an unexpected thing - even if it is what were are looking for ("the next big thing.") Yes, its "Anarchy in the UK" or "Reservoir Dogs", or - as importantly, those works that prove the potential, take it to a next level: "Pulp Fiction" then; or "Money." In a dynamic culture we are always looking for this, and are more surprised if it doesn't occur than if it does. A brief lull in the culture is the vacuum in which the new art will shine. Nobody was expecting the Smiths or Tarantino but the culture wasn't surprised when they appeared; and, as importantly, had the structures in place (independent record labels; Sundance festival) to quickly adapt to the new dynamic. The other way, is where the cultural actor (it could be an artist, but as I'll explain it could be someone else), is where we have invested our cultural interest to such an extent that we are primarily looking in that direction. The structures we have - and more than that, the "tastes" of the nation - are as predictable as a military parade in North Korea. When the "event" happens then we have already put in place the receiving mechanism. It will be anything except ignored. A healthier culture would not invest so much in these cultural bombs; but we are not a healthy culture - too much depends on respecting the status quo, and without a demographic, political or technological shift to signal the need for the new, we can do nothing other than offer faint praise for the mediocrity. This is the world where the BBC gave over so much of its programming to the launch of the (now forgotten) U2 album "No Line on the Horizon" that Andrew Marr referred to working for "the U2 Broadcasting corporation." (Get well soon, Andrew.) This is the world into which The Phantom Menace (and possibly The Hobbit) dropped; this is the world where "Be Here Now" is the fastest selling album ever, and this is the world where a mediocre, and possibly slightly strange portrait of an otherwise uninteresting person is front page news because she is married to the heir to the throne. Its eminently possible that something culturally remarkable may have happened in the last few weeks, but our culture is now programmed to praise the mediocre to such an extent that it would not have the structures to do anything other. On a minor level, this is the Guardian only ever interviewing or reviewing poetry at any length when it has the imprimatur of Faber, Picador or Cape; it is the excitement over a new Salman Rushdie, Ian McEwan or Martin Amis book; it is X-Factor, and the Olympics and the Premiership. It is, also, ironically, why there is such much interest in the new David Bowie single/album though his last real "hit" was nearly thirty years ago. For Bowie, like Tarantino, or "Star Wars" or Martin Amis has enough cultural capital to make any return, any return-to-form, anything not too dreadful, a welcome one. We praise the mediocre because it has a familiarity which has already been approved. Kate Middleton's (I have no idea what her real name is nowadays, the royals make these things up as they go along) portrait will be the most talked about work of visual art this year and it is an irrelevance whether it is good or bad. It is meant to be mediocre; it could not be anything else. Or rather, if it transcends its origins, (as a good soundtrack album might adorn a poor film), then it is an accident. For wherever we look, the most important work - the most important cultural work - is happening outside of these media bursts; and despite the availability of everything on the internet and elsewhere, the mainstream press and television have to show a willingness to look beyond the expected if they are to remain valid. There seems, I think, to have been some abdication of responsibility - not helped by our utilitarian leaders - in an age where the mainstream is able to set the agenda almost immune to failure. When a film crashes it used to bring down a studio, but even an absolute turkey like 2012's "John Carter" brought in enough box office to cover its production budget (if not its real costs.) Of course, away from the mainstream there are many things that do bloom, but to go back to my previous posting, artists need to find a way to live, publishers need to be able to make enough money to survive and grow, and audiences need to be able to access less publicised work. The critic doesn't become mute in an age of mediocrity, but he or she knows that his voice cannot be heard above the deafening mainstream. That an okay single by a great artist, and a mediocre portrait of a woman famous only for who she married, are our two cultural signifiers this week is a sign of the times we live in - and bloggers, writers, friends-on-Facebook, tweeters end up all becoming part of that conversation, even though this week and next my own cultural experiences encompass new electronic music, poetry launches, and experimental performances. Back in November, Robert McCrum's Observer column talked about "writers with other careers." I didn't blog about it at the time as I was far too busy, yes, with my working life. Its an interesting subject and I wanted to go back to it, in part because, he conflates several different things here: the writer (a psychologist for instance) whose work gives them an additional insight; the poet who is glad to have a day-job as something to do; and the writer (Beryl Bainbridge) who also paints. Almost all of his examples are from the distant past, yet in an age when "work" has become a totem, and any interesting jobs are apparently being test-driven by unpaid interns, it's an important subject. Most writers I know work. They certainly don't make much from their writing but more often than not, their writing, the thing they are best at, is - at least peripherally - at the centre of their work: whether its teaching, training, copywriting or journalism. But again, I don't think this is what McCrum is talking about. He's talking about "other jobs." I've been surprised how many poets I know seem to be based in the academy, either as creative writing tutors or teaching poetry. Three friends have recently started PhDs in contemporary poetry, and its this conflation of writer-researcher-teacher which seems to have become the default model. An obituary for the Irish poet Dennis O'Driscoll, makes much of his working life as a civil servant: "in the civil service you are assigned a grade. You know your status." It's kind of pleasing to read; since as someone who's always combined a non-literary job (currently in local government) with writing I have to say that it's often got puzzled looks from both sides. Within work, its seen as a quirk, a hobby, but not without its benefits (I once got asked to write a poem for an article), though its not something I'd tend to mention if I was going for a promotion. (Local government doesn't really go for quirks.) Its actually outside of work that I've had the most problem: where I've sometimes got the impression that I'm not really a writer, because I've got a day job. What a day job does give is some other experience - though whether I write any more about offices than say someone who works from home every day is a moot point. In my case the travel I've undertaken over the last few years has fed into poems, and into the fiction I've recently started, as I've combined work meetings all over Europe with a bit of location scouting. What of course it doesn't give you is time. Nick Laird, also in yesterday's Guardian, talks about missing work - paid, non-literary work, that is - "it was lovely to work on a team and feel that the work you are doing is important" he says of his lawyer's life, but the contemporary professional has to do such long hours that it precludes anything else it seems. That, I think, is the rub. No wonder (young) writers work for minimum wage in bus shops and bars, the temporary hours allowing them time to write; the mundane work often allowing them to dream and even read. Yet, Laird's poetry - unlike O'Driscoll's it seems - is not overly concerned with the world of work: but with what he saw from his window growing up in Northern Ireland. Work, it seems, even exciting work, doesn't always have an easy translation into poetry or fiction; but then again why should it? Yet, writers need more than Virginia Woolf's "room of one's own", they need money, they need publication, they need something other than splendid isolation. Like Laird, I've always done a professional job, as I've figured if I'm going to work at non-literary stuff then I should at least get a decent salary with it; yet there's also been compromise there: I'm certainly one of the lowest paid of my university group, as I've changed careers several times, and moved from the private to the public sector. For myself, its less the level of renumeration that matters; but the demands that the job has on you. There seems little room for the liberal arts in the coalition's grand plan for UK PLC, and though free university, or living off the dole, inevitably aren't going to come back any time shortly, we have to find some ways - as individuals, as society - for creative people to work AND live. I wasn't the only one shocked to hear that Factory musician Vini Reilly had got into financial difficulties struggling to pay "food, rent and electricity". This is in Manchester, where politicians and civil servants can't open their mouths without mentioning Factory records' legacy. Musicians, it turns out, and probably writers as well, aren't necessarily the best business people. None of this is a case for special pleading; but one way or another writers need to find what suits them and allows them to both write and live; and perhaps a little more understanding how difficult that can sometimes be. Charlie Hill's debut novel, "The Space Between Things" (Indigo Dreams), is set in one of those almost forgotten times, the early 90s John Major administration, where, for a brief moment, rave culture looked up from the dancefloor and the pills and became political. Arch is an all too typical boheme of the time, sat in his cheap digs in Moseley in Birmingham, smoking dope and partying as part of an ever shifting demi monde. It's that time in a person's life when responsibility hasn't intruded, when it's possible to believe that dope, music and squatting might be a true alternative to the 9-to-5. At a party he meets Vee, and his eyes are opened, albeit briefly, to another life. For whilst he is casual, Vee is serious, and yet they seem made for each other. When she goes off, almost as quickly as they've met, and then disappears for several months to a war-torn Balkans where she's taking photographs of potential war crimes, Arch has a slow coming-of-age. The dawning of his own political views is a gradual one, and less to do with his pining for Vee, than the brutality that him and his friends encounter following a week long rave at Castle Morton. Between the Stone Roses and Happy Mondays dropping E in1989 and the rise of Britpop, there were a brief few years, when a strange fusion of hippy politics and dance culture fused together. In the grey years of the Major administration, road protestors and techno hippies, travellers and ravers, briefly became public enemy one, and the Criminal Justice Bill was rushed through parliament outlawing public gatherings with the playing of "regular beats." It is this millieu, almost written out of any pop cultural histories that I've read recently (certainly with none of the nostalgia of Britpop or grunge), that Charlie Hill so eloquently maps. For Arch is a bit of a poet-philosopher despite a can't be arse attitude that is typical of both the times and the place. There's hardly been any fictions that have looked at squat culture - Doris Lessing's "The Good Terrorist" from a decade earlier is the one that comes to mind - and this debut has some of the shambolic nature of that culture. Arch is sort-of an unreliable narrator in that we only get a partial view of the world. The Castle Morton rave is just another party to him and it's only afterwards that it becomes a big deal. The ne'er-do-wells who he shares a flat with are dropouts and drug casualties and drifters, and his loyalty to their wellbeing is somewhat less than that of a friend, but more than that of a stranger. When Vee returns, the love story that frames the novel, begins in earnest. That they only existed as an idea before, a one night stand that is turned into a great love in Arch's mind, works up to a point, but she has returned from a horror that she won't even talk about to find Arch is no longer the loveable comic doper, but is putting his energies into this newly politicised scene. Yet, having come from a real civil war, Vee is exasperated to find that the only thing that has got this generation up in arms is freedom for the right to party! Hill is excellent on the minutiae of this millieu, and the pre-regeneration, pre-internet of Britain's inner cities is nicely brought back to life. He's also very funny, although there are times when Arch's stream-of-consciousness telling of the tale reads verbatim. The short chapters help us whizz through the seasons, yet we're never entirely convinced by the love affair at the heart of things. There's so much veracity in the story, that one wonders a little at where the fiction begins and ends, and Arch and Vee's initial meeting is told in retrospect and doesn't entirely convince. That said, for a novel of near-contemporary events its fascinating to re-read the recent past. I'm suddenly puzzled as to why road building was the issue du jour of the traveller community - it seems parochial in the extreme! We rarely go beyond the squat culture of Moseley and Arch remains a somewhat inert presence as he takes us through the deteriorations of his community and his relationship, but that's perhaps inevitable given the looking-back nature of the novel. Like Max Schaeffer's recent "Children of the Sun", Hill finds a wealth of material in a slightly forgotten recent subcultural world, and it brought back memories of going to see Back to the Planet, Chumbawumba and Megadog. But I was a tourist in this world, for by 1994 the illegal party scene was no more, and the traveller convoys were no longer in the news. A different nineties, disconnected from a drug subculture that briefly got political, was about to begin. Imagine a scabrous British poet (were such an individual to exist) writing a pseudo-novel positing an imagined alternate history of 20th century right wing literature, interweaving a motley collection of murderers and madmen alongside the existing canon, complete with scholarly footnotes and bibliography, it is likely, I think, that it would never see the light of day. Yet, this is exactly what we hope for and expect from a posthumously translated novel by Roberto Bolano, the Chilean writer who died in 2003 before his unexpected Western success. "Nazi Literatures in the Americas" has one of the most arresting titles in recent fiction, and yet its not some clever device, it really does describe the novel's contents. Bolano has written an alternate literary history of the American continent (primarily focussed on South America, but with some entries for the North) which also acts as a compelling alternate history of that troubled continent. We've tended to think of radical literature in terms of the "left", whether its counter-cultural writers or utopian leftists, yet Bolano reminds us, through this dark satire, that much of the 20th century was blemished by various fascisms, and that the repressive regimes of the Americas were rarely communist, but led by powerful juntas whose role models, more often than not, could be found in the now-discredited Nazi Germany. It creates quite a jolt for a western reader; and one remembers half-forgotten stories of Argentina being a haven for Nazis after the war, and of the right-wing juntas (frequently supported, at least tacitly, by the U.S.) that have so often militarised the politics of that continent. Yet, by writing a history of imagined "Nazi Literature", Bolano cleverly highlights how art and culture can exist in even the most oppressive of regimes, and how absurd the idea of a "Nazi Literature" actually is. For the "brief lives" described in this entertaining selection of short biographies, covers a continent with misanthropic literary losers, writing dark tracts in isolation, creating phantom presses, publishing houses and magazines that disseminate a certain kind of right-wing literature. Its only a novel in the loosest sense of the word, but hangs together as a succession of connected anecdotes or stories. The structure is that of popular criticism, chapters on "North American Poets", "Magicians, Mercenaries and Miserable Creatures" and "Wandering Women of Letters," with pen portraits running from a page to many, and an epilogue consisting of a bibliography and extended list of "secondary figures." In this book, Bolano takes great delight in documenting a series of monstrous literary follies that one can only be glad don't exist, but which would make perfect sense in a right wing canon. From epic poems, to memoirs, to small poetry sequences, to experimental manifestoes, Bolano's litany of writers cover ever conceivable genre. Yet the tone throughout is always satirical. Books are released "to little impact"; novelists and poets disappear for years at a time; magazines and publishing houses appear almost as ghosts. The longest story in the book, the final one, about "The Infamous Ramirez Hoffman" sees Bolano himself make an appearance. It appears to be the touchstone story of the book - (perhaps the first written? or at least the key to what has come before) - where a notorious murderer-poet is more myth than man, yet Bolano is tasked to find him, both in the pseudonyms he may have used to write his work and in real life. I do wonder how well we are served in the translation here, and in other stories, as these tales are fabular ones in many ways, and at times it feels like we are losing some of the archness and directness of the stories in their translation to English. Beyond this pen portrait of the novel, its difficult to analyse in great depth - the allusions to writers and scenes are probably packed with the actual literary history of the continent, and there may well be antecedents to many of these misanthropes, yet it is enough, I think, to appreciate Bolano's deadpan humour. These writers are literary archetypes of the worst kind. They strive away for years in their madness; their life stories are full of death, despair and destruction; their career trajectories are those of madmen and monsters; yet this all makes some kind of cruel, satirical sense. Each is given a birth date and death date - even those outliving the author - and we cross a continent, with Argentinians, Mexicans, Chileans, even North Americans. As a kind of richly comic literary tableaux it even works, in some ways, as a novel, though its clever structure, and Bolano's dark humour make it a genuine one-off. Wasn't going to write any resolutions, but the blog was looking a bit bereft with "zero posts" in the 2013 category and my early visit to the shops has been curtailed by a late get-up.And actually these aren't resolutions as scuh - more dichotomies - and I need to move the slider along the line a bit. 1. Work-life balance: this has to change a bit. I hardly took any holiday in 2012, but with work I went abroad 12 times. Great fun and experience, but each trip tends to lead to it being a 60 hour week, as though I can claim time back, I've not had the time to claim it back. So, one way or another, need to make sure I take more holidays/days oweing or cut down on the demands of the job. 2. Books v Space. This is an ongoing battle, and currently the books I buy are almost going straight into boxes ne'er to be seen again, which is a bit pointless, or else creating tottering towers of words, which daunt me even when I think "what shall I read next?" Though I've got a Nook now, I'm not sure it will have much impact on my hardback love. So, I either need more space (move to a bigger flat/house), or less books. Rightmove it is then. 5. Ottolenghi v KFC. Not that I go to KFC very often - once a quarter I'd reckon these days - but neither do I cook that much either. I got Ottolenghi's Jerusalem for Xmas, so cooking a bit more, a bit better, is something I want to do. Used to cook a lot, and like recipe books, but got lazy (or too busy), both to cook and shop for the ingredients. So more Ottolenghi (or Nigel Slater or whoever) and less crap food on the run. 7. Twitter v Facebook. Not really. I've always been catholic with my social media, though find them less compelling than I used to Great for social connection (hello Facebook poets) and for finding out stuff (hello Twitter link bait) but my suspicions that they are not exactly revolutions, but evolutions seems to be coming true. But I guess though my job requires me to "keep up", I've not really "kept up" with Path or Google plus or Instagram or whatever the latest thing might be. If data is the new oil, then to be honest, the pipes are already there; other things are likely to be mere add-ons. But given that I'm not taking these platforms too seriously, a New Years Resolution should be to not to take them too seriously. Twitter rage is a real phenomenon and drowns out real debate. Ignore or block. 8. Literature v Literature. Not a dichotomy even. I don't really read much that isn't literature, one way or another. Fifty Shades of Harry Potter will have to wait until my dotage when I can only consume mush, I guess. But literature's a broad enough church I think. However, the "must read" list gets longer, and with tired eyes I don't read half as much as I'd like. So, New Year's resolution of traditional kind: read more. 10. 2013 v 2014. Is this a year for now or a year for preparing the ground for the next now? I'm a bit live for the day, really, it tends to make me a bit happier - and I can fret about the future as much as anyone. However, there's a sense that decisions I make this year might have longevity; so a bit more future-planning wouldn't go amiss right now. Isn't that what resolutions are about anyway?